Penguins are flightless birds that live in the Southern Hemisphere. Few species of penguins like emperor penguins live in the real cold of Antarctic islands where the temperature never rises above the freezing point. Many of us may wonder how these flightless birds live in the icy marine world. Nature has built their body to adapt the cold easily. Although nature has provided the body mechanism to work without the effort of penguins, there are also steps that penguins take to survive the cold. Penguins are excellent swimmers and divers. Gentoo penguins can swim at the speed of 22 mph and emperor penguins can dive to the depth of 1,700 feet. Penguins are social birds that like to be in the colonies especially during the breeding season. When the penguins molt, they avoid being in the cold since they shed their old feathers and wait for the new ones to cover the body. Every animal that is in the cold region is larger. Penguins are no an exception even they are birds. Emperor penguins are the largest of the flightless birds that live in the cold Antarctic. When the size of the animal is bigger, certainly it will be warm-blooded. Penguins spend a lot of time in the marine than on the land. When penguins swim, the feathers protect them from the body getting wet and the fat layer helps them stay warmer. When they are on land, the blubber (the fat deposit) around the body helps them maintain the body temperature and the feathers insulate them and can shed the wind. Penguins engage maximum time to treat their body temperature. Penguins make their feathers waterproof by rubbing oil from the glands and make them also windproof during winter. The fat layer also insulates the heat and avoids the loss during long winters. Not every penguin experience severe winter. Penguins like Galapagos penguins and African penguins stay in a tropical climate where they fluff their feathers and spread their flippers to release the excess heat from the body. Penguins have black dorsal and white ventral coloration, which camouflages them from the predators. When the penguins swim, the black upper part seems like the portion of the deep sea and the white under part mixes with the sky and puzzles the predators that are above the water surface and that are underwater. The black body absorbs the heat from the sunlight and the front part posed to the colder area. The penguins show the blackbody towards the sunlight by sitting or lying on their bellies to get warmer. As said, penguins are proficient swimmers and divers. The torpedo-shaped body helps them in action more efficiently. Since they are good at swimming their ancestors lost their flying ability. When the penguins swim they almost fly in the water at good speed. They are energy-efficient when they are underwater. Penguins’ webbed-feet and the short back and tail portion avoid drag and let swim easily. Penguins have solid bones and the bulky body aids them in diving deeper. Penguins propel their flipper to reach to the surface and they can dive to the depth of 1,700 feet and stay underwater around 25 minutes in a single breath. The streamlined body shape of penguins works well when they are in water than on land. Penguins get airborne when they emerge from the sea to the land and when they jump from the land to the cliffs to get away from the predators. Penguins’ body does not involve them in flying due to their physique. Also, penguins have good vision underwater than on land. Penguins’ eating habits depend on the species, place, and availability of the food. Penguins eat krill, squids and fish. Smaller species of penguins prefer mainly krill and squid than fish varieties. Emperor penguins eat fish and squid in large quantity whereas; Adelie like small species of penguins feed on krill and squids. Penguins feed in the sea. They swallow their prey while swimming and they have very good vision on the ocean and their swift move towards the prey makes them easy to hunt. Penguins have strong jaws and spiky tongue which holds the prey with grip and doesn’t let it slip. When the food source is far from the colonies, penguins feed through the seal holes and other holes in the ice. Penguins go through the molting season where they shed their old feathers and wait for the new feathers to grow and help to combat the cold. During the molting season, penguins fast and before the fasting, they build up the fat layer to prevent extreme cold striking the body. They not only fast during the molting season, but also they have long fasting days when they breed. Some species of penguins also fast during the nesting, incubating, and courtship episodes. Emperor penguins lay one egg whereas, other species of penguins lay two eggs. Female emperor penguins go for hunting leaving the eggs to the male penguins to incubate in their nest; the big fold of the male gives enough warmth to the egg. When chicks molt for the first time, parents stop feeding them and they fast for the first time which leads to weight loss. Once they complete the molting season, chicks have to feed on their own without the help of the parents. Stones intake: Few species of penguins are found to have eaten stones which then examined and the reason behind the intake of stones are yet unsolved. When it comes to huddling, emperor penguins are the topmost species which huddle and survive the frigid Antarctic cold where the temperature reaches -20 degree Celsius or below. During the huddle, there is an interesting understanding between the species. They pack themselves tightly in an in the crowd and takes a turn to face the icy wind by moving their positions. After getting enough heat or sometimes when the penguins in the middle get overheated they come out of the huddle and feel some cool wind to get back the required temperature. When the penguin’s huddle they don’t lose the body temperature, there will be a loss of heat only in the head and face which exposed to the cold wind. After the turns some individuals come out of the gathering and clean their feathers and some eat the snow. Once the penguins finish cooling the body they again join the huddle when they require the heat. This process continues throughout the winter. Penguins are heavier birds in the marine. Even though the waddling walk of penguins is considered as messy by many, they conserve a lot of energy by the waddling with their short legs. Since their legs are short, the leg muscle has to pull and which consumes maximum energy while walking, penguins are found to be waddling thus reducing the loss of heat. The gait of penguins is comparable with the walking of pregnant women and obese folks. For each swing, the potential energy stored when the penguin stills at one side and then goes back for the movement, the energy is converted into kinetic energy thus the energy exchange happens for every to and fro. The large head and the bill which is the direct contact to the icy wind are avoided by bending the head facing towards the ground and by tucking the bill under the flippers. The flippers have scaly feathers which are waterproof and strong. The webbed feet of penguins are strong and are insulated by a plastic-like a sheath and the claws are strong enough to sustain the cold. Also, the webbed feet are of great help when the penguins swim underwater. The tail of the penguins is also strong and brush like which protects the penguins from the direct contact of the cold surface when they sit. Sometimes, the penguins lie on their bellies to get warmer to face the sunlight on the body. The bulky body of penguins helps them hold oxygen for a long time while swimming when compared to the smaller animals or birds under water. When they propel from the water to the land they pop out swiftly and glide on the land which makes a more interesting for them. When looking at the penguins they will look like as if they don’t have knees. In reality, penguins have knees that are not visible since the plumages cover it. They have long leg structure which is helpful in swimming and climbing cliffs. The legs set slightly back of their body which leads to the upright position. When standing, penguins tip up the toes to avoid the chillness from the icy land. Penguins have shiny, short and dense feathers which insulate the body from cold and also act like a waterproof. Penguins are the topmost of all the bird species that have a dense and large number of feathers. During molting season, penguins rub their body to shed the old feathers and preen their body to clean it up. They also clean the old feathers by rubbing on the ground or sometimes by cleaning in the water. While preening, they clean, rearrange and oil the new feathers to make it waterproof. The new feather grows by pushing the old feathers and it doesn’t fall off until the new one grows completely. Penguins are adorable to look in the other seasons, but during molting, season penguins look shabby and sick. Penguins change places in search of food and move from the colonies. According to the availability of food source, penguins migrate from the old colonies. During the heavy frigid atmosphere, penguins shift their places to the cliffs and rock shelves to prevent over chilling. Even though they move their stay, they have to get warmer and cannot beat the cold without the comfort of the fat layer in the body. Penguins swim for long distance in search of food and also they find the new place where there is plenty of food available. The elongated body makes them good swimmers. Penguins have to dive into the ocean in search of prey. 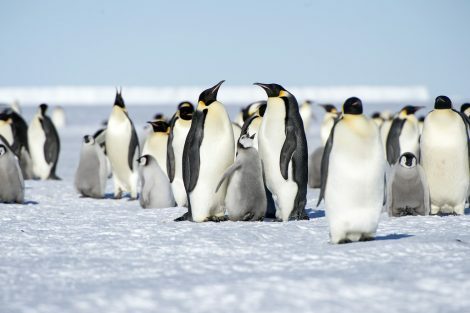 For some species of penguins, the prey is available in the lesser depth of the ocean but for species like emperor penguins, they have to dive deeper to find the prey. 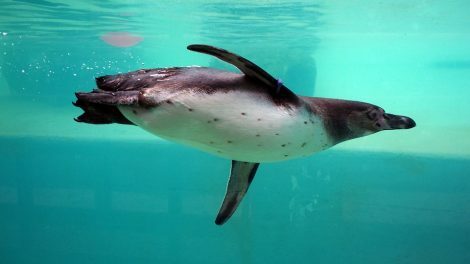 Penguins’ lung capacity to hold the oxygen is less when compared to the seals. The red blood cells present in the penguins’ body offers the last molecule to utilize the oxygen. So, there is an internal organ understanding in the penguin’s body. Apart from this, penguins muscle tissues also store the oxygen and supplies when needed to stay underwater. The muscle tissues can work even without oxygen by the distinct enzymes produced by the body. Penguins themselves also lower their heart rate to five beats per second and store the oxygen. Except for the king and emperor penguins, other penguins follow the porpoising technique that is found similar in dolphins. Penguins come out of the water, inhales and exhales for a while and rapidly dive back into the water for hunting. It is possible for many of us to think, how an animal can survive the deadly winter of Antarctica without food and shelter. They not only survive the cold by adapting to the environment but also they breed in the same unfriendly atmosphere. The appearance and characters of the penguins depend on species and the place where they live. The average lifespan of penguins is 20 years in wild and 30 years in captivity. Apart from the natural challenges faced by penguins, there are many human interruptions and harming done on these beautiful flightless birds. The predators of penguins include leopard seals, orcas, skuas, and giant petrels. 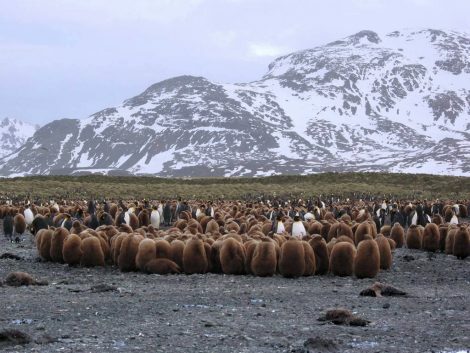 The major technique followed by penguins to sustain the icy wilderness is the huddle. They have to huddle to get rid of the cold wind. When we look like a spectator, the penguins are not found to be adjusting with a lot of skills but when the researchers tell us about them; it is a surprising fact about the remarkable creature. Are there Penguins in the Arctic?